The beautiful way to increase the value of your home. Create more outdoor room by making a desirable styling space that people can enjoy. 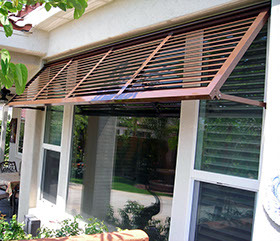 Atlas Awning's Alumawood by Amerimax® is an industry leader, built on a solid reputation of reliability, comfort, and style. Click here to see the gallery photos, then click one of the small photos to see the slideshow. View our Newport Solid Roof photo gallery, a solid roof provides the protection against the elements. Atlas Awning recommends a Newport Solid Roof for customers that want a completely shaded area that is protected from the elements. The LightStrip fitted on a Newport Solid Roof. This photo gallery features a revolutionary product that adds ambiance and style to your patio. 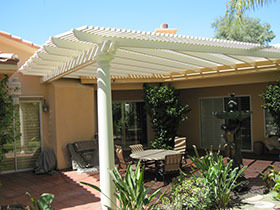 Traditional Patio Cover photo gallery. The traditional mobile home patio cover is where it all started. Back in 1972, a mobile home patio cover was the latest fad in the industry. Little did everyone know it would stick around as the indusrty standard. Atlas has been specializing in these types of covers since then. 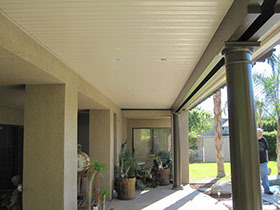 View our Equinox Louvered Roof photo gallery. 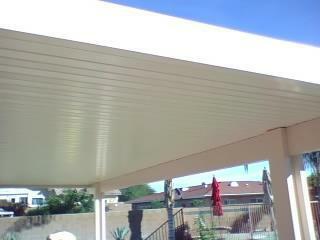 We are the largest installer of Equinox Louvered Roof Systems in the Palm Springs - Coachella Valley Area. View our Commercial Cover Photo Gallery. The gallery includes our work at The Agua Caliente Hotel and Casino in Rancho Mirage and Polo Cantina at Eldorado Polo Club. Bahama Exterior Shutters are a unique option to traditional awnings and shutters offering protection from the sun and heat without blocking your view.